Richie Ramsay and Andy Murray are in a very similar predicament at the moment - both competing half way around the world while they await the arrival of their first-borns. And, if the soon-to-be golfing father's mind was elsewhere, his current top-15 place within an all-star field at the Abu Dhabi Championship does not give him away. The 32-year-old made eight birdies to finish at six under before play was suspended because of darkness with 60 players still to finish their second round. 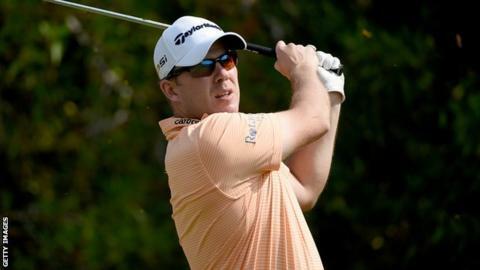 "Everybody is talking about how good the green is this week, and it is fantastic, but the rough is really tricky, so 66 round a course like that is a great effort," he told BBC Sport. At the close of play, England's Andy Sullivan leads at 10 under par after two rounds of 67. He is trailed by US amateur and overnight leader Bryson DeChambeau, who is one back at nine under. Northern Ireland's Rory McIlroy and Rickie Fowler are both at five under, with playing partner and world number one Jordan Spieth trailing them by two shots. After carding a round of 73 on day one, Ramsay was much happier with Friday's performance. "Yesterday I struggled if I'm honest, I dug in there hard and just sort of ground it out," said the Aberdonian. "Today was a lot better, I did putt very well - even I was impressed with the way I putted on the greens. "But it's part and parcel of it. You've got to get the ball in the hole as quickly as possible and I got that done - 66 is a great score. "Very pleased with that and very upbeat about the weekend to come." World tennis number two Murray said he would fly home from the Australian Open should his baby arrive early. Ramsay, though, has plenty more excitement to come. He plans on taking in the Qatar Masters and Dubai Desert Classic before becoming a dad. "Things are going to change pretty quickly," he said. "I'll be changing nappies hopefully be the start of March, so I won't be able to practise my putting as much. "It'll be all hands to the deck I think." However, the 201 South African Open winner knows he has his work cut out before then if he is going to take some valuable time off with his wife, Angela, and his new family addition. "My job is to get the job done, and done well, over the next three weeks and then I've got time to rest up and look forward to the birth," said Ramsay. "And I can't wait for that, but I've got a job to do now, so I'll let Angela deal with the rest for now." So it is back to business at the Abu Dhabi Golf Club, where fellow Scots Russell Knox, from Inverness, and Glasgow's Scott Jamieson both made the cut and sit one under par going into day three. For Ramsay, that means back to avoiding the Scottish winter and enjoying the sun soaked greens a little longer. "I'm just pleased with the attitude, pleased with the game and obviously, when it's blue skies, great golf course and a great field, it makes it pretty easy to play golf," he added.